Coffee is something that we can hardly resist having when we don’t have any motivation to stay awake. In fact, it is the first thing that we want when we open our eyes in the morning. Coffee is not just a brewed drink made from cute little brown seeds; it is the soul food for many like us to keep going all through the day. Coffee is a helpful stimulant that can keep us charged and energetic to work enthusiastically. Around eighty countries in Asia, Africa, South and Central America and the Caribbean grow coffee. Coffee can be prepared by anyone depending on the individual tastes and requirements. Coffee is not just a delectable drink but is full of many health benefits and these make it a superb drink for us. There are a number of antioxidants and beneficial nutrients in coffee that can prove to be valuable for our health. It can help you in becoming smarter and can increase energy levels by making you feel less tired as contains caffeine, world’s most commonly consumed psychoactive substance. Caffeine may even help you in burning fat. A person, who takes one cup of coffee in a day, has lesser risks of developing diabetes in comparison to the person who has never had the beverage. Having a cup of coffee can even make you happier as it is capable of fighting depression. From heart to liver, coffee has amazing effects on your body helping you live a longer life. The art of drinking and making coffee has been varying since ages. People from different parts of the world like to have their coffee their own way, unique and amazing. Luckily, with the advancements in the technology and living standards, one can try all the types of coffee at one single place. Here are the seven most popular coffee drinks that will boost you with energy. Espresso is the foundation of a wide variety of coffee drinks. This strong black coffee is prepared at a high pressure by forcing boiling water and steam through a compressed bed of dark-roast aromatic coffee beans in an espresso machine. It can be recognised by thick & golden-brown foam on the surface. This is the most common coffee type that can be easily found at any corner of the world. It is prepared using milk froth, steamed milk and espresso. Its delish flavours and richness make it a perfect luxurious drink. The foam of the coffee is higher than the height of the cup and is visible from the side of the cup. It is made with a single shot of espresso mixed with a cup of hot water in order to keep the flavour, texture and body of the drip coffee for Americans. The ratio of milk is kept the least in this so as to enjoy the perfect taste of from the espresso. It has become a creamy & rich espresso-based coffee in many parts of the world. The coffee is the combination of three parts of freshly steamed milk to a single shot of espresso served in a tall glass. This gives you a high-end milk coffee experience. Sugar can also be added to the latte matching your taste accompanied with some saccharine cookies, cake slices or even fresh Italian bread. It is a French drink that is very similar to caffe latte except the fact that its uses brewed coffee instead of espresso. The delicious coffee can be prepared using brewed coffee with steamed milk in a 1:1 ratio. You may also add sugar to it as per your taste. This is a variation of cappuccino or a caffe latte that is served with added chocolate powder or syrup. Its taste may vary from person to person who prepares it. Some grated chocolate or cocoa powder can be used to top it just like a ‘cap’. Even, whipped cream can be used to garnish it. Different coffee houses prepare it differently. But generally, it is prepared with the combination of foamed milk, espresso and caramel and a little of steamed milk can also be used. For that amazing extra flavour, vanilla is also added to it. Sugar can also be added but before adding it, taste it as it can already be very sweet. A coffee maker or a coffee machine is the appliance that helps you in brewing the best coffee to treat your taste buds. There are a large number of coffee machines that differ in the ways they use to brew coffee. Coffee makes our mornings the most palatable and the coffee maker used to make it obviously needs to be the best. With the new advancements in lifestyle and technology, the demands for the attractive coffee brewing machines also raised leading to the inventions of different types of brewing machines. The main task that a coffee maker does is brew coffee for you. More the convenience, the expensive it would be. And remember, the quality of the brew does not at all depend on the cost of the machine. In general, a coffee maker consists of a paper or metal filter inside a funnel used to place the coffee grounds and a glass or ceramic coffee pot. A coffee maker makes your life a lot easier as you don’t need to put in much of your labour to get the best coffee in the morning. All you need is a coffee machine that does that all for you. For your different tastes of coffee, there are different types of coffee machines or coffee makers. The choice of the coffee makers completely depends upon the choice of coffee you like to have. To satisfy your taste buds, you may pick up the best coffee maker for you from the market. Brewing coffee might be a regular morning task for you or might be a task that needs to be done precisely and perfectly. You may choose any out of these on the basis of your choice and requirements. The single cup coffee maker is the perfect choice for you if you want to brew a single cup of coffee without facing any much hassle. Along with these, you might require buying single-serve K-Cups or Pods depending on the design of the machine. If it uses K-Cups, you won’t be able to use Pods and vice-versa. The K-Cups and the Pods are designed specifically to fit in a specific type of coffee maker. 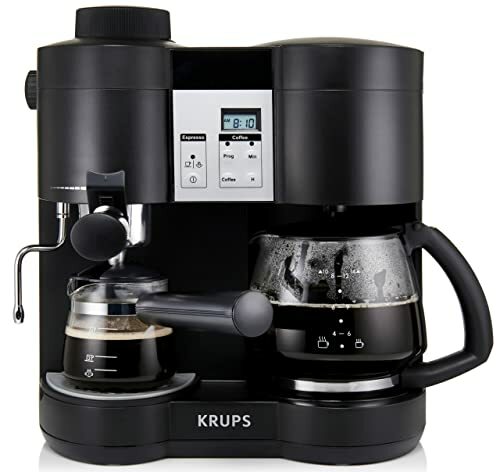 This type of coffee machine is perfect for small households where the number of coffee drinkers is quite less. These use an efficient and fast process of brewing. This one is the most common type of coffee maker used over the globe. All you need to do is put some water in the reservoir and ground coffee in a paper filter, as soon as you will switch on the device, your coffee would be ready. The additional point that gives it an extra point is a timer in it for the automatic brewing. The glass carafes are placed on a hot plate that keeps the coffee hot. The hot water is forced to go through the coffee filter that contains coffee grounds or beans. You can even set the programmable Drip Coffee Maker to make coffee for you the next morning. To have a more exciting coffee drinking experience, getting a Cappuccino or an Espresso Machine is a perfect idea. 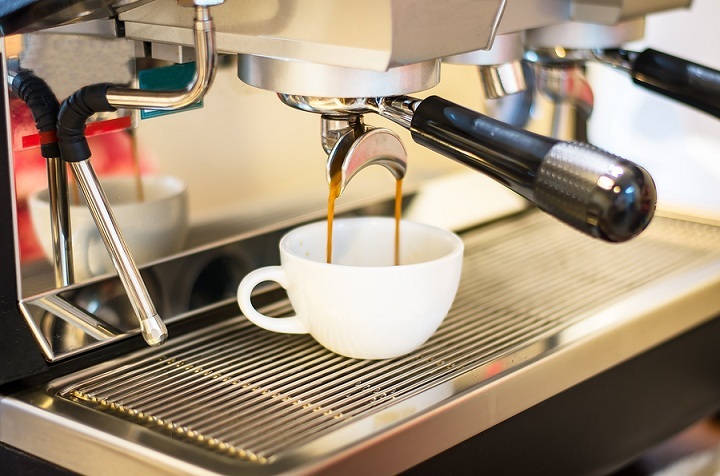 There are different types of Cappuccino and Espresso Machines that you may choose as per requirement like Semi-Automatic Espresso Maker or Pump Espresso Maker or a Fully Super Automatic Espresso Maker. These coffee makers can use any type of ground coffee and can get you as many espresso shots. You can even make two different shots at a time or one double shot. It is the simplest type of coffee maker that is preferred by many coffee lovers. It uses relatively simple and old techniques of brewing coffee that makes it a favourite of many. The best part of these is that these don’t need electricity to operate and are actually very inexpensive. This is basically the best coffee maker for the ones who like to brew their coffee on their own. It has remained the same over the years despite all the new advancements and technologies. A coffee percolator constantly brews coffee by cycling the boiling water through the coffee grounds and the process utilises gravity in order to reach the preferred strength. The small chamber at the bottom of the percolator is placed near a heat source. The top chamber of the percolator is for keeping the ground coffee and the water is slid into the water chamber. It is best for making strong coffee or dark roast coffee. It is available in a number of sizes. These coffee makers give you the complete control of making your coffee. The coffee maker is simple to use. You only have to place a filter on the top of the glass vessel, and then add ground coffee and in the end, hot water is to be poured over the coffee grinds. You can make your coffee according to you by adjusting the temperature of the water, by using different kinds of ground coffee and even using your own timing and technique for brewing. Its thick glass adds a completely new flavour to your coffee. This coffee machine uses new and exclusive techniques of preparing coffee. It is also called Vac pot or siphon coffee maker by many. It is very alike to the Italian stove-top espresso maker. These are sure to give you delicious coffee but the process may take some time and you may have to keep patience. It comes with a stove burner. Water is forced from the lower chamber to the upper chamber containing coffee grounds. When the heat is taken away, the cooked coffee gets filtered via a filter into the bottom chamber to be served. This method is very efficient as it extracts all the essential oils for a perfect cup of coffee. It contains an insulated carafe making it different from the other coffee makers. In this, the coffee is directly in the Thermal carafe where the right temperature of the coffee is maintained for a really long time keeping the aroma and taste of the coffee alive. It is always a great choice to choose the thermal coffee makers over the normal coffee makers so as to not adjust with the perfect taste and aroma of the brewed coffee. The Moka Pot contains three chambers for the grounded coffee, water and finished brewed coffee. These use the combination of Espresso and percolator coffee makers. It is one of the most commonly used the stove top espresso makers in the world. In the nutshell, there are a huge number of coffee makers or machines used in different types of the world. The choice is all yours now, which one you would like to buy. All of these will do the same thing, i.e. provide you with a delicious cup of coffee by using different techniques.